Easter is nearly over for this year, Year A. Somehow I have noticed it more this year, perhaps because I have started to read and think about the lectionary in advance of Sunday. Again this week there is no OT lesson, but there is a choice of three Psalms depending on whether we use the Thursday lesson on Sunday or not. These are Psalms 47, 93 or 68. Psalm 47 celebrates ascension, the same word we have seen as a theme in the past two weeks. Ascension is going up, aliyah in Hebrew, going up to read Torah, or going up to Israel for Jews returning to the land, or going into the house of God with burnt offerings. Who can understand the ascension of Jesus as if it were a rocket launch. No. It is a going up into the presence of God, seated in the heavens, as Paul writes to the Ephesians. Seated implies a ruling monarch. To sit is to have been enthroned as ruler. Bill Morrow of Queen's University once commented that the whole of the OT is about governance. How do we humans govern ourselves with equity. We are still learning, aren't we. Ascension is also about acceptance. In Hebrew, burnt offering is the same word as ascension. They are homonyms if you like, but I prefer to think that the one is the consequence of the other. The ascension of Jesus is a confirmation that his offering of himself on behalf of others has been and continues to be accepted by God. The ascension confirms the resurrection and the appointment, as we read last week, of the human who was raised from the dead as the one who judges with equity. So - if our governance is on behalf of others, it conforms to his sacrifice and is acceptable. If our governance is not for others, but only for the protection of our jobs, or bonuses (even the gentiles do as much), or the benefit of a few at the expense of others, it does not conform and the result is various forms of inequity, catatonic bureaucracy, violent suppression, and incapacity. Governance as a theme might be an interesting one to follow during ordinary time (soon to commence after Pentecost next week). Governance gives power over others. In Psalm 46 the weapons of war are destroyed. The LORD makes wars cease to the extremity of the earth, bow he breaks and sunders spear. Wagons he incinerates in the fire. In Psalm 47: The princes of the peoples gather as the people of the God of Abraham. For the shields of the earth belong to God; - i.e. the power of the state submits itself to the power of this God - what kind of a God is the God of Psalm 47? In both the Gospel in Luke, and in Acts, the disciples are instructed to wait in the city for the power that will come upon them. We need to ask what kind of Spirit this is, what kind of power, and how we are to apply such knowledge to human governance. Many of the institutions that were built in Christendom incorporated such a spirit into their policy. I have seen with my own eyes and I still have the evidence of the power applied within process and bureaucracy in the administration of mercy. In this way cooperation rather than violence and incapacity was stimulated and engaged. So also in hospitals and schools as well as government such vital work should not be subject to the limitations of funding or convenience. The power entrusted to the resurrected one seated in the heavens is available - not distant. We must learn to wait for it and to expect that creative factor to overcome our limitations. Then we can clap hands, or slap a palm, and shout for joy and sing a psalm with insight. The music of Psalm 47 will stay on one page if I don't add the English. How would you fit an English underlay? My translation is below. For a fine brief on the Ascension see this post from the OUP Blog. I have put a full PDF of Exodus 20 in the usual shared place here where there are accumulating hundreds of snippets of the music of the Old Testament. This one is unique (so far) in my hearing of the music embedded in the hand-signals. The current version of my program allows interpretation of the complex texts of both Exodus 20 and Deuteronomy 5 and as far as I know will still be OK for the other cases. I changed the formatting of the XML to make it easier to read - so it is hard to do a simple regression test. I removed the breath-mark from the XML and replaced it with a rest. And I fixed some limitations and errors in counting things. Exodus has some interesting points in both music and translation. There may even be some irony in the accented musical figures created by doubling a sub-linear sign on a change in the reciting note. In the short commandments, they provide emphasis on the first and last syllables. Plenty to ponder in the music and still some testing and analysis for me to do to make sure I am covering all the possibilities. I note also conflicts about building steps and the use of cut stone. These requirements must have been dropped to build the temple with its steps. So many questions. I did some strange translation - I called these the 10 declarations - so I could match word usage through the passage. I note also that the word generation is not in verse 5. The word used in Psalm 19, innocent, is also used here (will not hold innocent the one who takes his name in vain). There appears to be no word for innocent in English that lacks a negative affix. For the work on the Sabbath, I used public business. It is from the word for angel! melakah. So it is sort of like the domain of power that we exercise within the 6 day week. I struggled for a word for the traditional neighbour. I used friend, since I tend to use neighbour for a word related to 'living near'. For thunders and lightnings I did something different, callings and firebrands. And note that word declare again in verses 18 and 19. The last verses have sexual implications. I did not expect them. Perhaps they link to the declaration of verse 14. For make overture see also Psalm 91. Moses makes overture into the dark turbulence. The issue of polluted cut stone I have already mentioned. The connection of steps to uncovering nakedness is unexpected. Deuteronomy 5 raised a lot of questions and demanded more programming. There were also several errors - missing verse markers, etc, in the input data. I will have it done sooner than later. This is a delightful read from Jim Gordon of Living Wittily. The use of the te'amim in Exodus 20, the 10 commandments, is quite different from every other section of Scripture that I have looked at so far. There is a great density of ornamentation, a frequent use of two reciting notes on one syllable, and equally frequent use of an ornament on a change of reciting note, creating an accented appoggiatura that gives unexpected character to the passage. There are a number of questions that Suzanne Haik-Vantoura treats differently. If one has both a change of reciting note and an ornament on a syllable, which one takes precedence? She sounds the change of reciting note before the ornament. This may smooth things out, but it is not necessarily the only possible decision. My program does some things now that I cannot easily explain! That is because I am dealing with the vaguaries of Hebrew transcription and syllabification into Latin characters concurrently with deciding the reciting note and the ornaments. Also I have to deal with the limits of my ability to hack out the computer programming in Oracle PL/SQL and the limits of the language of Music XML and the ways in which it interferes with itself in a particular XML reader. For instance the tag replaces a prior tag rather than interpreting both. And in Musescore this causes a confusion of tuples and slurs! So I have had to number these without going too high or the program crashes. Because Musescore does not adjust breath-marks correctly when copying, I have decided to replace the breath mark with a rest. That corrected the conflict, but upset my syllable counter! and also I noted that some recitations exceed my maximum bar length of 24 beats so giving a false reading of the maximum recitation length (sometimes). 24 beats is the width of two horses drawing a chariot - so I don't dare make the bar risk exceeding the page width. If you ever use my XML transcriptions, be prepared to fix a few things manually. For instance yom is one syllable but if you add a change in reciting note and an ornament, I will interpret it as two syllables. [I do hope to fix this.] Sometimes it is very difficult to distinguish a mater from a vav as consonant. Especially when the character string is 28 characters long instead of the expected 14 (operating in extended html). I am impressed actually with the way the program handled this complexity. It only took 2 days to figure out which language processor (transcription, XML, Musescore, or me) was the trouble maker. Now for the musical issues - there are so many. Here's the picture: the down arrows show where there are accented ornaments on a change in reciting note - highly unusual anywhere else in the 250 sections of Scripture I have looked in so far. The ovals show where I need to change the program to allow longer melismas on a single syllable. At present I have truncated melismas longer than a triplet (except for the qarne-talsha combination which has length of 6 notes). The pentagons show where two reciting notes are marked on a single syllable. Very rare in those 250 sections of music that I have seen so far. Verse 11 is like other passages. You can see I have included no special markings in the image. Tell me what you think of these differences. If unique, this would surely represent a musical comment on the text. Full PDF with English underlay here. Another post on this subject is here. Last week, I found that the building of the new temple was a theme in the four lessons. It linked the old and the new. This week I wonder if I will be so lucky. Nothing jumps out at me in the first read-through. Paul is said not to have been too successful in Athens. We have no letter to a church there. His message as reported by Luke includes this: that God "has fixed a day on which he will have the world judged in righteousness by a man whom he has appointed, and of this he has given assurance to all by raising him from the dead." Imagine the Greek philosophers hearing this and - um - what was that you said, Paul? It's right there in the next verse - they burst out laughing. Science is good - even Greek science, and it may yet have the ultimate laugh when it grasps the mystery of the awe in our midst. We are instructed at the beginning of Psalm 66 to "Raise a shout to God all the earth". Such laughter as is implied is deeper than a mockery based on our assumptions about how life works. There is another psalm where the mouths are filled with laughter (Psalm 126:2). Psalm 66 is both more sober and more universal in its shout. The lips and mouth in this psalm promise to pay vows which were spoken when the poet was in trouble. The poet "will recount to all who fear God what he has undertaken for my being". This is a poet under discipline. I have the music in PDF form here. The English underlay was more difficult than usual. The feel of regular rhythm in the Hebrew syllables is quite strong and I cannot imitate it in translation. Does this music, through the verses that begin with a rising fifth, indicate that there is a stanza structure? Look at the sequences of phrase shapes in the first half of each verse and how the mid-verse rest-point (A) is approached. Verse 1 G-B-A, verse 2 E-F-E-A. Verse 3 E-B-G-B-A, verse 4 E-C-B-G-E-A. verse 8 E-G-F-A, like v 2 approaching the sub-dominant from below. Verse 9 E-B-G-A, verse 10 E-F-A, verse 11 = v 10, verse 12 = v 10. Verse 13 E-B-A, verse 14 = v 10, verse 15 = v 4 (cf v 6). Verse 16 = v 3, verse 17 = v 2, v 18 = v 1, verse 19 = v 1, verse 20 = v 10. There is an obvious link between Luke's recording of that last line of Paul's sermon and 1 Peter 3:22 "who has gone into heaven and is at the right hand of God, with angels, authorities, and powers made subject to him." All things whether in heaven or on earth are subject to the Anointed one. What then is the connection of Paul's and Peter's words and the Spirit coming as the Comforter? And how does the Psalm fit in? Paul is speaking to the Gentiles. Peter is writing to the dispersed tribes. Psalm 66 is the middle of three harvest poems that are themselves in a wider set of circles formed by the inscriptions of books 2 and 3. The fields ripening to harvest are the Gentiles. So the psalm begins with the whole earth raising a shout to Israel's God. The shout turns out to be for the salvation of Israel through the sea and through fire and water (like Tamino in Mozart's Die Zauberflöte). Verse 8 asks all the peoples to make heard the voice of praise to Israel's God. Verse 16 asks all who fear God to pay attention to what God has done for the poet. This is our cue to see in the poet's identity the whole of the people of Israel passing through trouble, and being delivered, even as the Anointed Jesus passed through trouble and was delivered from it. Then all can praise God for the exaltation of the man in Paul's and Peter's words to the position of judge, so the promise of the Psalms that God will judge the world in righteousness can be fulfilled. I invite you to sing the music. 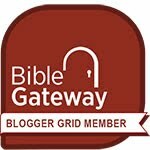 Does the pattern of the first phrase in the previous post recur in the Bible? There is at present no way to search for a musical phrase, i.e. a sequence of notes, or a sequence of te’amim without intervening notes. However, I have found similarly shaped phrases in Hannah’s song in 1 Samuel 2, and within the Psalms the pattern of the first phrase of Genesis 1:1 occurs in Psalm 5, verse 4 (with an intervening ornament). Are there a sufficient number of patterns of music to determine patterns of meaning? This is a question for operations research and the law of requisite variety. From the point of view of the musical phrase, do you think there is a theological reflection in 1 Samuel 2:6 on Genesis 1:1? This is a summary with a simple example of what the work of Suzanne Haik Vantoura means to me. If you were going to write a book on this, which passages of Scripture would you include? Let’s begin with music. In the beginning of God’s creating of the heavens and of the earth. Pitch any of the music where it is comfortable for you. The opening is a major triad followed by the subdominant, doh, mi, sol, la. Then descend a major third to re where your mode includes the awkward augmented second from re to mi. Then back to re and back to doh. We have even fewer notes than the doh-re-mi song in The Sound of Music. That is the first verse of Genesis. What class of music is this? How many differing phrases are there? What does it say about the text? Does singing the text change its meaning? There are so many possible things to notice about the text and the music. Note that I have put a caesura in this short phrase. A caesura is a pause. It means take a rest and think about what you are in the middle of. In English, it reads: in the beginning of God’s creating. In the beginning of God’s creating what? Take up the tune again: the heavens and the earth. This second half of the verse is the direct object of the first half of the verse. We know that it is the direct object from the little word ‘eit’. This word is spelt alef-taf. It is comprised of the first (א) and last (ת) letters of the Hebrew consonant alphabet. It signifies that the direct object of the verb follows. There are two direct objects in the phrase, hashamayim, the heavens, and ha’arets, the earth. To match the rhythm of the Hebrew, we might translate the phrase as; of both the heavens and also the earth. But generally speaking, the direct object marker את is not translated. Why didn’t I translate as usual: in the beginning, God created? There are a lot of good reasons. In Hebrew, it is often the case that a word ending in ‘t’ indicates a special form of the noun that says ‘more to come’. In this case, the single word bereshit, is ‘in the beginning of’, not just ‘in the beginning’. There is a suggestion in the form of this gerund from the verb ‘to begin’ that creation continues and that time is different from the time-line that we imagine. It is not as if God ‘created’ and then just let the clockwork happen. Music is more than a single note. Music gathers words into a single phrase that holds the beginning in the end and makes time in a sense, stand still. We will have a lot to say about the heavens and our earth, our land, even our own individual piece of the ground which we know as body, a body with ears that can hear the music it sings, a body with heart that can know the singer of the music, a body with eyes that can process the information in the music, the text, and its history. So bereshit is more than a distant big bang, and more than a distant act of speech. It is also a continuing presence and a promising end. In our typical Latin-based texts, we have 26 letters and punctuation. Our letters are either vowels or consonants, a single letter (like Y or W) occasionally acting as either. Our punctuation is indicated through fewer than a dozen marks, comma, period, semicolon, colon, dashes, quotations, and so on. In the Hebrew Scriptures, there are 22 consonants, a dozen or so vowels, and the te’amim, a set of 22 marks considered for the last 1000 years as punctuation. David Mitchell dubs them “punctuation on steroids”. These accents make considerably more sense as music. Hebrew vowel sounds are indicated by dots and dashes under the consonantal letters. Both vowels and te’amim are under and over the letters of the text, like this letter bet with an ‘a’ under it, בָ pronounced ba or va. The te’amim, called marks of taste, like this mark, בֽ, can be considered as disjunctive or conjunctive signs like punctuation, but they are also of sufficient complexity taken together to be hand signals or chironomy, signs indicating the movements of a conductor of music. The te’amim consist of two overlapping sets of signs, one for the books of truth, Psalms, Proverbs, and the speeches of Job, and one for all the rest of the Hebrew Bible. For convenience, I will distinguish these two sets by the names poetry for the three, and prose for the remainder. The first thing to note about the te’amim is that there are exactly eight signs below the letters for the prose and seven for the poetry. What a musician immediately notices is that these could be applied to a musical scale, the full octave for the prose, and a modal scale for the poetry. The remaining signs, with some duplication of those used below the text, all occur above the letters. There are eleven in use for the prose and eight for the poetry. The overlap between the sets is quite comprehensible to a musician. It is feasible to learn to sight-read the music, much as a musician can sight-read tonic sol-fa or a musical staff. Here is the first set of marks, the scale for the prose books as deciphered by Suzanne Haik-Vantoura (SHV). These she sets to correspond (reading left to right) exactly to a tonic sol-fa scale with a raised fifth. C D E F, G# A B C. Notice how close the poetry scale is: D# E F# G A B C.
All these pitches are relative to the tonic, the third note of the prose scale and the second note of the poetry scale. The tonic is signified by the silluq ֽ under the letter. Readers of Hebrew will recognize that this sign occurs at the end of every verse. Each set also comes to rest on the A subdominant. Readers of Hebrew will recognize the sign, ֑ the atnah, as the primary disjunctive mark in many verses. SHV interpreted the set of signs that occur above the letters as ornaments relative to the current pitch. The current pitch is determined by default as the tonic until a sign is encountered that changes it. The current pitch remains current until a new sign is encountered below the letters. The ornaments return to the current pitch either on the current syllable or on the next syllable. The determination is made based on placement of the sign and whether the pitch changes on the next syllable. Here are the ornaments for the poetry books as they would be interpreted on a musical staff when the current pitch is A. On the right is the full scale. The full set is available here. 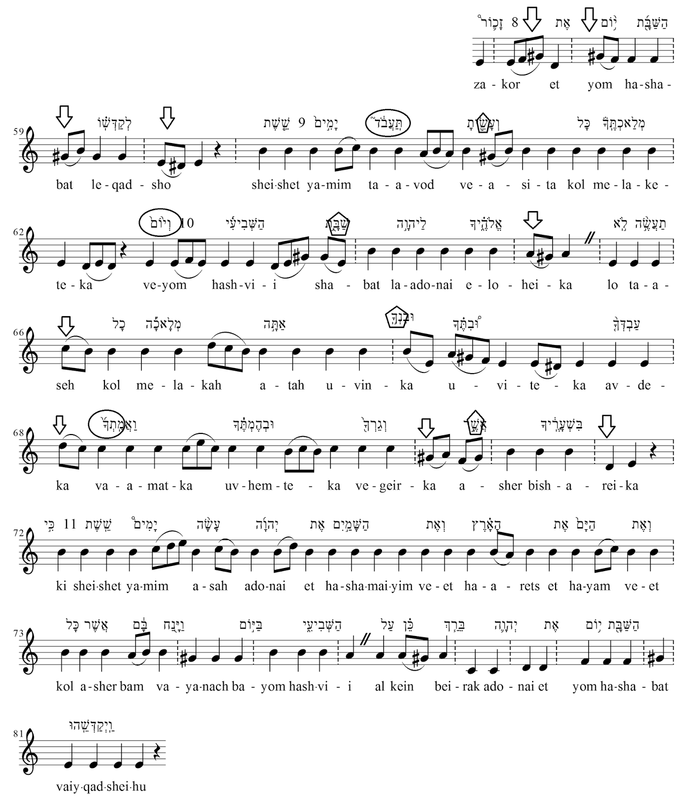 In all the many examples developed by SHV, she says she has applied these notes without exception to decipher the music from the Hebrew text. She recommends using the Max HaLevi Letteris edition (1896). Mitchell (2013) points out that her bias is not justified in that she likely never saw the more reliable Aleppo Codex. All the music in my recent posts has been derived from the Hebrew text of the Westminster Leningrad codex (www.tanach.us/Tanach.xml) and edited where necessary and where available to agree with the Aleppo codex (www.aleppocodex.org) or (in a very few cases) the Letteris edition of 1946. Now that the technical part is dealt with, let’s put all the pieces together, the original Hebrew text, the syllables transcribed into Latin characters, and the musical signs for this first phrase of the Bible. Music is more than notes. This opening snippet of music gathers 18 syllables into two phrases. The first word shows a change in reciting note on the third syllable. So we move from E to G#, from doh to mi. The second syllable of the second word shows a sign that moves us to sol (B). Then the first of this pair of phrases has a rest point in the middle (fa, A) marked by the atnah (^) on the third syllable of Elohim. We rest on God’s creating. Even in the middle of a thought, we rest. The fourth word, the single syllable direct object marker, shows that we move to F (re). Then the third syllable of hashamayim, the heavens, moves us back to G# (mi). The second syllable of the sixth word, the second direct object marker, moves us back to F (re), and then we reach the tonic doh, again on the silluq on the middle syllable of the seventh word. So we have a musical movement from tonic to subdominant in the first phrase. Each stressed syllable follows the dashed bar line which always occurs at a change in reciting note. Then a musical movement from the rest point back to the tonic. Each phrase has three stresses and each leads to the end of the phrase as one would expect of music. http://home.scarlet.be/~tsf07148/theo/Resinging.pdf published in the Journal for the Study of the Old Testament 36/3, March 2012. The word טעם ta’am, taste, from which the name of the signs is derived, can also mean a slight madness. Both these meanings are evident in the alphabetic acrostic poem, Psalm 34, verses 1 and 9 in the Hebrew numbering. In verse 1, David feigns his madness so he can escape from Abimelech, and in the first word of verse 9 (tet being the ninth letter of the alef-bet) the poet uses the same word to mean taste. So called from the first letters of each book: alef-mem-taf, meaning truth. The choice of E is arbitrary and may be adjusted to a lower pitch if singers or instruments require it. She is quite subjective at some points especially in mode 4, rejecting the A# where it suits her taste. Nonetheless, her consistency is very high if not as rigid as a computer program must be. David Mitchell (2013). How can we sing the Lord’s Song? Deciphering the Masoretic Cantillation in Jewish and Christian Approaches to the Psalms: Conflict and Convergence, ed. Susan Gillingham, OUP. I don't usually write on 4 pre-selected texts at once, but of course I think about them on Sundays when that day rolls around, and sometimes delight in the connections, and sometimes not, depending on how grumpy I am in the morning. These texts are from the Revised Common Lectionary, a process that was begun somewhat recently and continues to draw in readers within the Christian congregations, that all of us might together be learning from a set of common texts read in sequence over a period of three years. There are four readings in this ministry of the Word: from the 'Old Testament', from the Psalms, from the Epistles, and from the Gospels. (See here for lots of frequently asked questions). The Revised Common Lectionary, first published in 1992, derives from The Common Lectionary of 1983, both based on the Ordo Lectionem Missae of 1969, a post-Vatican II ground-breaking revision of the Roman Lectionary. The Jews have a similar pattern of learning from the Scriptures, but their focus is continually on Torah, the five books of Moses. They read them in sequence once a year. Associated with each section of Torah is a passage from the Prophets. Some of the Writings also have traditional times when they are read, e.g. the Song of Songs during Passover, the Lamentations on the 9th of Av, and Esther at Purim. But it appears that in both Christian and Jewish tradition, the lectionary will not cover the whole of the canon during a complete cycle. I note in the link above that to read from the Scriptures in synagogue is called aliyah, literally, going up, or ascension. It is also the word for the whole burnt offering. Reading in public is therefore clearly important, as important as going up to the land. So what about this week in Christendom? The first reading is from Acts (instead of the OT). I miss an OT lesson. The reading from Acts is about the death of Stephen, who asks the Lord Jesus to receive his spirit. In Ecclesiastes 12:7 we read that on death, the spirit returns to God who gave it. "Then shall the dust return to the earth as it was: and the spirit shall return unto God who gave it." One question arises immediately, why did Stephen (or why did Luke, the author of Acts depict Stephen so) put this request to the risen Jesus? Does this relate to what is expected of Jesus by those who knew him after his own ascension? Notice that the ascension of Jesus represents the acceptance of and completion of his own self-offering. The next 'reading' is Psalm 31 - with a great chunk removed. (I object to the cutting out of the difficult bits of Scripture - and the readings in the lectionary seem to be strangely selected at times.) There is a clear reference to entrusting the spirit in verse 5 (Hebrew Psalm 31:6). This is a traditional Psalm for Compline, the last service of the day. The entrusting of the spirit at the end of the day is entrusting to sleep, that in the new day, we may also awaken. The first use of awaken is in Psalm 3:6 and the last in Psalm 139:18. So we see a clear link to the words of Acts 7:59. The words of this psalm are also on the lips of Jesus at the time of his crucifixion (Luke 23:46). The Psalmist, Jesus, and Stephen are seen in a single tradition. Psalm 90:1 has the idea for dwelling-place embedded in it. My Lord, a dwelling-place you yourself have become for us from generation to generation. The connection to the psalm is direct but via another Greek-Hebrew door. And where is the place that Jesus is going to? The place is a cipher for the temple, the place where God has set his name, the new temple that we have already been referring to. And our questions are many, but the confidence that we read of in John's farewell discourse on the role of the Spirit to which we have been entrusted, that confidence is as great as any question we ask. We could spin out comment on this gospel considerably. The Father in the Son and the Son in the Father, God in Christ reconciling himself to the world in the one whose life redeems the world. Do we believe? Do we see the work that is being done? The creation and redemption of the world is what is seen in the words and work of Jesus which the Father is accomplishing (even now) through him. And greater works than these are to be done by those who believe because he goes to the Father. Somehow this needs to be translated, doesn't it? Some people are really uncomfortable with masculine imagery for God. I am not sure what can be done in this discourse, but the Spirit is not so limited, so I leave it unresolved - for the few seconds it takes you to get to the next sentence. God the creator, in God the Redeemer, and God the Redeemer, in God the Creator are doing a work that we participate in through God the Spirit, and that is the same Spirit that is God in whom we live and who lives in us, in the same way as God the Redeemer lives in God the Creator and vice-versa. Our spirits are committed into the nurturing care of God who is Spirit. To wrap up the thought, let's return to Psalm 31 - and here, let's look at a few words that go beyond guessing at the nature of God. Into your hand I entrust my spirit, you have ransomed me, Yahweh, God of truth. Yahweh, the personal name of God has its first entrance into the text of the Bible in Genesis 2:4. I always come back to one of my favorite poets, George Herbert, when I read that verse about the Day that the Lord God created the heavens and the earth. He says we count 300 (meaning 365) but we miss - there is but one (day) and that one ever. Can there be any day but this, though many sunnes to shine and endeavour? We count three hundred, but we misse: there is but one, and that one ever. Well there is always a first post - this is too much and too little at once. Enjoy.